Fill in the blank fields so all rows, columns and 3x3 boxes contain all of the nine different hues. It works like regular sudoku, but instead of numbers it has colors. 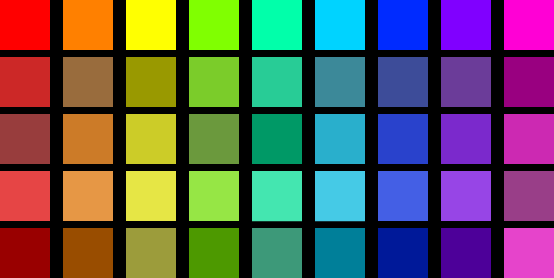 In Chroma Sudoku colors are the "same" when they have the same hue (red, dark blue, magenta, yellow...). However, saturation and brightness of the colors may vary. Click on a circle from the hue selection, then click on the empty field where you think that hue might fit. The counter will add a point if you are correct, and remove a point if you are wrong. The maximum score is 40 if you finish the puzzle with no mistakes. It is possible to have a negative score (the score will turn gray). A solved puzzle with the highest score. Examples of the "same" colors. 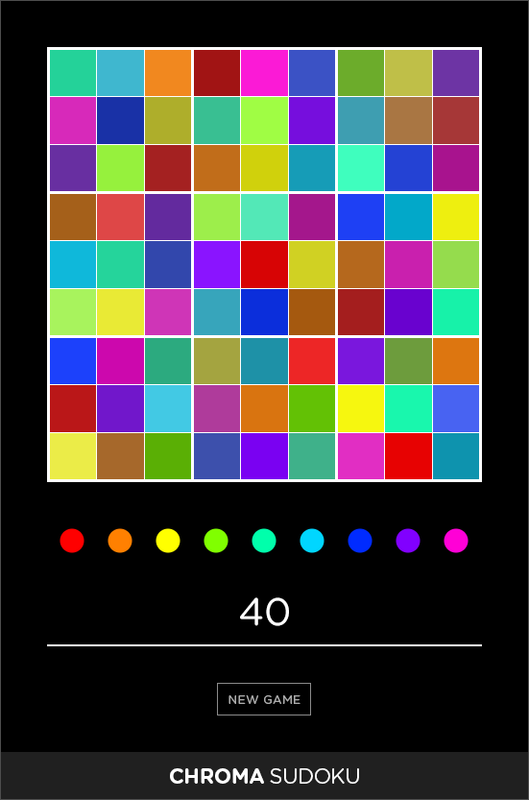 The colors in each column are considered the same in the Chroma Sudoku puzzle, because their hues are the same. Chroma Sudoku exploits our shift in hue perception when colors change saturation or brightness (Bezold–Brücke and Abney effects). Dirtier yellow appears more green, desaturated dark blue looks purplish, etc. It also challenges the common notion of similarity between colors. Some examples where colors with different hues might look alike.